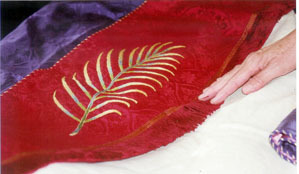 Vestments and altar hangings are more than a colorful, occasionally changing backdrop to worship. They are congregational treasurers that enhance the liturgy, says Mary Wagner, who volunteers in preserving and repairing vestments at the Convent of St. John Baptist in Mendham, N.J.
Wagner works to preserve such treasures, and teach others how to do it. 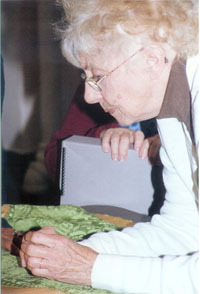 In February, she and fellow convent volunteer and ecclesiastical embroiderer Carol Homer will lead a workshop on vestment restoration in Mendham. The art of vestment repair and preservation isn’t as tricky as some fear, Homer notes. “Good housekeeping does a lot.” Examine vestment storage areas. Are there leaks or “creepy crawlies” such as mice or insects? Is the room excessively hot in summer or unheated in winter? “Look for moisture. If you have metal handles — and they’re getting rusty, that’s a bad sign.” You may want to install a dehumidifier. Hang vestments on fabric-padded hangers. Wire hangers eventually cut the fabric, damaging the shoulder areas, “which can be costly to repair.” The hangers should be unwrinkled at the top, where garments will touch, and stitched on the bottom, so that the garment won’t rub against the stitching. Store hanging vestments beneath a simple muslin or cotton cover, stitched down the front. Line wood storage drawers with Tyvek#, a durable substance that protects vestments from dust and prevents stains from the wood. Don’t wear jewelry such as rings while handling vestments. Catalogue your collection. Photograph vestments front and back, on a person and hanging alone. Make two copies and place each with an identical notebook listing the vestments. If you wish, add details about the history of each vestment, such as when it was dedicated. You also can include photographs of how the altar is set up for various occasions, such as Easter. Keep one copy of the catalogue at the church, the other stored safely offsite. It will prove invaluable in case of fire.